World Deputation 2010: Home from camp! Hello all! Team St. Pete, checking in! We figured it was about time to give you all an update, and to show you some of what we've been doing for the past 3 weeks. They seem to have flown by, though some of the individual days seemed to last forever (funny how that happens). The past two weeks have been spent teaching VBS at camp. Well, a sort of VBS anyway. Two days before we left for camp, we were informed that we weren't allowed to talk about God at all. This certainly came as a shock. We were going to be monitored as well, to insure we didn't. Since our VBS plans were the different characterisitics of God, this also led to some frantic rearranging. We managed though, definitely learning that in Russia the only motto to follow is: "Be flexible!!" We managed to come up with a program based off the story of the wise and foolish builders, hoping to show the kids ways to build a solid foundation for their lives that happened to correspond to lots of Jesus' parables. I think we managed pretty well, and hopefully our kids picked up some good stuff from us. We managed to work God into the lessons in the last few days of camp, as we gained the teachers trust and they stopped watching us during our lessons. Our kids were definitely a handful, but we fell in love with them over the two weeks. We were working with orphan children who were ages 7 or 8 to about 14 and 15. It was pretty difficult. Most of the children had some sort of ADD or other attention disorder, and all of them acted out often. They were all so desperate for attention and love, it was heartbreaking. We had two children who became extremely violent when they got angry or upset, which was often. All of the kids resorted to violence very quickly which was hard for all of us. It was very sad to watch them sometimes, though we are all pros at breaking up fights now. The camp was a strange one--it was very different from any camp we've seen in the states-- and we were never quite sure what we'd be doing from one day to the next. We had our kids twice a day, in the morning and afternoon. 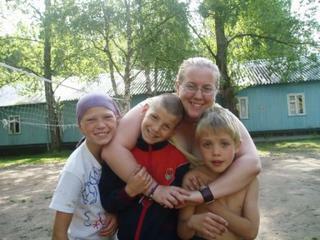 We spent a lot of time jumproping, playing Pioneer ball (Russian kids version of volleyball), soccer, and Uno. One of our greatest achievements is that we can now play a complete game of Uno in Russian! The kids were fun to play with, and they all got very good at sign language by the end of the two weeks. Our interpretors were invaluable as well, and we learned very random Russian words to get along. All in all, we tried to show the kids Gods love through actions, since we couldn't through words. Hopefully we managed. The last day at camp was so difficult. It was very hard to say goodbye to the kids, as they were all beginning to really open up to us, and trust us more. I don't know if it was harder on them, or us, as everyone was crying. It was like a scene from a movie, with the kids surrounding the van and running with it until we managed to drive away. We can only hope and pray that we were able to impart to them that they will always be loved and taken care of, no matter what; or maybe stirred up some curiousity about God. We arrived back in St. Petersburg on Saturday, and will be working with the Nazarene church for the rest of this week, helping to maintain their ministry center by painting and doing other maintenance duties. We're all looking forward to the painting, and getting back to the apartment, and a working bathroom! We made do with an outhouse for the two weeks of camp. I don't think I've ever been more happy to see a toilet in my life! All in all things are going well. We've managed to stay healthy for the most part, though Kendra picked up a cold on the last few days of camp. I think we may all have lost some weight at camp, because the food wasn't the greatest, but it was an adventure! We've had our share of adventures so far, and are looking forward to more before we come home! We miss everyone, and hope all is well. Zvogom!